Who doesn’t love a rocking chair? 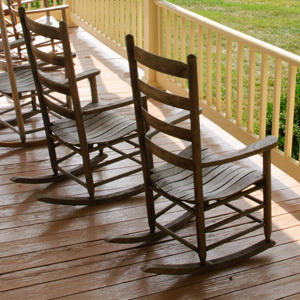 The rocking chair holds a special place in the culture of our country. There is nothing quite as relaxing as the rhythmic motion of a rocking chair, especially with the sounds of leaves rustling in a gentle breeze on a lazy summer evening. 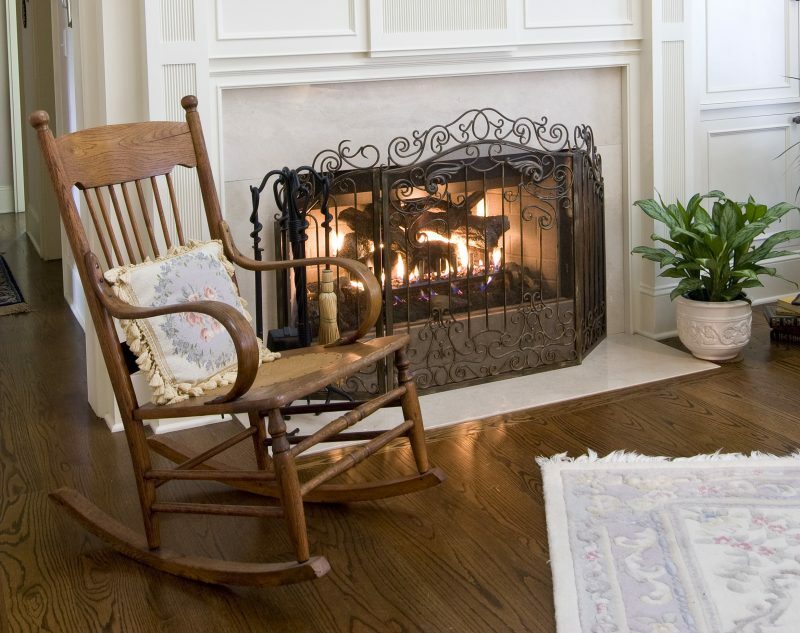 While the rocking chair is a distinctly an American passion, the forerunner of the rocking chair originated much earlier. The addition of rollers on chairs and rocking horses predate the rocking chair we know today. Rocking cradles were in use in Europe before the Middle Ages, while children’s rocking horses were popularized during the Victorian era. Benjamin Franklin is credited with the actual invention of the rocking chair in 1710, although other sources claim it was invented by farmers or by early cabinetmakers. The word rocking chair didn’t appear in the Oxford English Dictionary until 1787. The American Shakers, well-known for their simple, functional furniture, perfected the design and created some of the best rockers of the time. 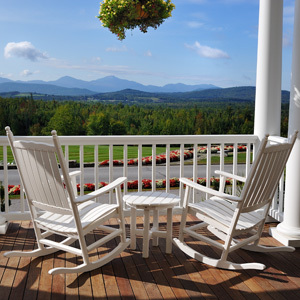 Outdoor style rocking chairs first appeared in England in 1725. 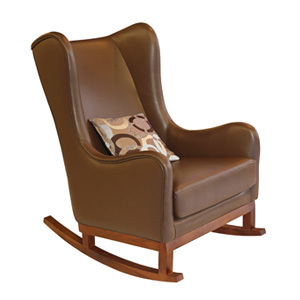 The Windsor rocker featured a hood-shaped back with birdcage-like spindles. 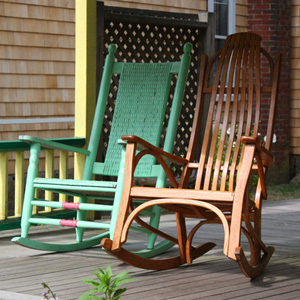 The Boston rocker was a variation of the Windsor rocker and appeared in New England in 1840 and was the first machine, mass-produced rocking chair. The Bentwood rocker originated in Germany in 1860. There have been a number of research studies that outline the therapeutic benefits of rocking include improved balance, relaxation, relief of arthritis pain, faster healing after surgery or birth, and ease of depression and anxiety. Rockers are commonly used in birth centers, nurseries, nursing homes, and mental facilities. Whether calming a fussy baby or just melting away the stress of the day, there is nothing like a rocking chair. It is literally a part of most everyone’s home. 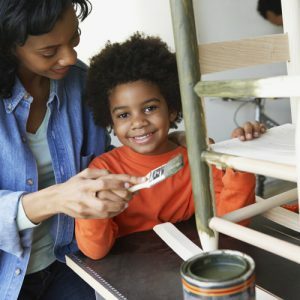 It is no wonder that making your own rocking chair is one of the most popular DIY projects. There are literally hundreds of plans for sale for various types of rocking chairs from simple to complex available on line. 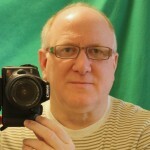 Many plans are free to download. Van Dyke’s offers a good selection of rocker runners in adult and children’s sizes to suit most rocker projects. a hard wood instead of a soft wood like pine. 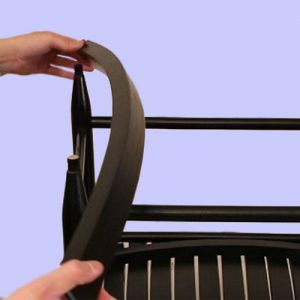 2 – Cut out each piece of the rocker according to your plans. This will include seat, back, legs, and arms. 3 – Cut notches as described in your particular project plans and be careful to follow directions carefully to make sure pieces will fit properly. 4 – Expert chair builders recommend assembling the pieces working from front to back. 5 – It is important to place the assembled rocker on the runners before drilling holes to determine the best placement. The front of the runner should extend 1 1/2 inches to 5 inches beyond the front leg and 4 to 9 inches beyond the back legs depending on the length of the runner and the distance between your front and back posts. This information is helpful when ordering the proper size ru nner. 6 – Use a level to determine proper placement and mark with a pencil. Turn chair upside down and measure distance between front and back leg posts and transfer this measurement to the runner you just measured. 7 – Once assembled, paint or stain. If the rocker is being used outdoors, you will need to apply at least two coats of a weather-resistant coating. We love seeing our customer’s projects! If you have made a rocker using our runners, send us a picture and we may use it on social media, future blogs, or catalogs.